Between 2003 and 2012, the newspaper workforce shrank by 30 percent nationally, according to the American Society of Newspaper Editors. That has included a major reduction in the number of newspaper reporters assigned to cover state and local politics. Newspaper layoffs have ripple effects for the entire local news ecosystem, because, as the Congressional Research Service noted, television, radio and online outlets often "piggyback on reporting done by much larger newspaper staffs.” Meanwhile, recent studies from the University of Chicago and the Federal Reserve Bank suggest the closure of newspapers can ultimately depress voter turnout in local elections. Colorado is a microcosm of the hollowing out of local media. In 2009, the state lost its second-largest newspaper with the shuttering of the 150-year-old Rocky Mountain News. 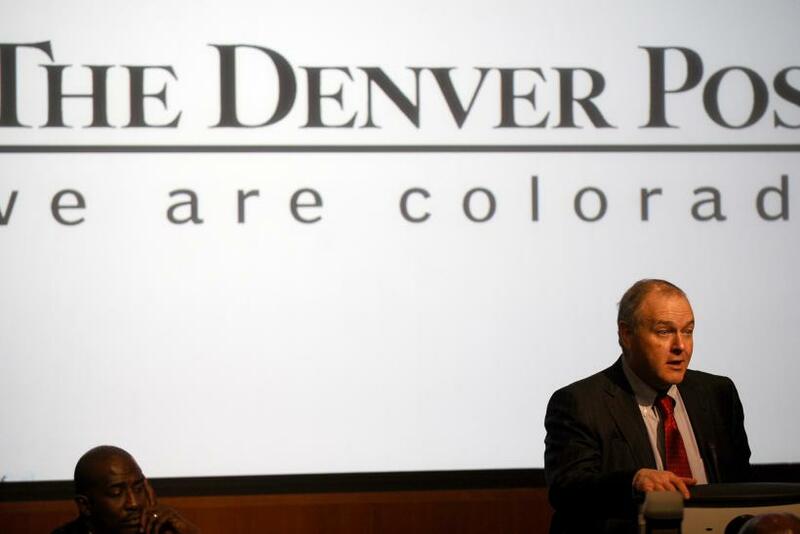 The state's only remaining major daily, the Denver Post, has had rolling layoffs. According to Post Editor Gregory Moore, in this election cycle the paper has only 7 reporters covering elections throughout the state -- a 50 percent reduction in the last 5 years. "We just don't have the resources to do what we were once able to do," Moore told International Business Times. "We try to select the competitive races that we really need to pay attention to, but in terms of having a body on every race, we just don't have the resources to do that." "It creates a self-fulfilling prophecy. When the local press assumes a race can't be close, then they don't cover it, and then that suggests to voters a candidate isn't credible," said Martin Walsh, the Republican congressional candidate challenging Denver's Democratic representative, Diana DeGette. "Ultimately, that guarantees that the race won't be close." "With so many newspapers and news outlets in general having fewer resources, there's no pressure or incentive for candidates to engage with the press and there's no echo chamber that makes candidates feel like they have to respond to anything," Fox 31 reporter Eli Stokols told IBTimes. An investigative scoop might get reinforced by an opposing candidate’s ads, Stokols said. But, "there's not a critical mass of media large enough or competitive enough to amplify scoops or gaffes or big stories. If it happens, it comes from national media from D.C. journalists recognizing something and blogging about it. But until it's on local TV or radio, it's probably missing most of the persuadable low-information voters out there." "If you are a candidate with a lot of money, you can just hide out, maybe write a few op-eds, and then go back into hiding, knowing that any bad story someone might write about you being unavailable will just disappear after a day, because there's no press to hound you," Stokols said. Gardner doesn't even put out media advisories letting the press know ahead of time where he might be, said Stokols. Gardner's campaign did not return IBTimes' call seeking comment for this story. Romanoff, the Democratic candidate in the 6th district, said that what little campaign coverage there is often ends up being about the candidates' ads, because that requires minimal time, travel and expense to cover. And with a record $89 million worth of political ads purchased in the state this election cycle, there is no shortage of new spots to review. "It’s not quite a Seinfeld episode, it's not a show about nothing, but the coverage has become a show about a show," he said, adding that it is a marked shift from his time only a few years ago as a state legislator. "Back then, there was a press corps that covered the capital, and there was news being made every day because you are voting on bills, you are amending them and there was a more robust corps of capital reporters. But on the campaign trail these days, the primary way to get to voters is through paid media and a grassroots field operation." During a recent get-out-the-vote rally featuring Hillary Clinton, former three-term Denver Mayor Wellington Webb reminisced about the city's legendary newspaper wars between the Post and the Rocky, when six reporters were assigned just to cover city hall. "It was a whole different game back then," Webb said over the din of blaring music, as volunteers stopped to take pictures with him. These days, candidates running for local office have to be more focused on old-school door-knocking campaigns. "The public is smarter than what you give them credit for, and you have to go out and be hungrier than anyone in terms of going door to door," he said. "But the question is, can you get to enough voters to make that choice?" That's a particularly acute problem for candidates in down-ballot statewide races. "On our limited budget and with no press coverage, we have to try to niche-target ads to key voting blocs," Ridder said. But while some smaller news outlets have shown signs of life -- even of profitability -- it’s not clear they can power a political campaign. "I have yet to see someone master all the alternative media out there in a way that really lets an underfinanced candidate compete," said James Mejia, a former Denver school board member who narrowly lost a bid for mayor in 2011. "All the digital media, the blogosphere, the neighborhood weeklies -- all of them are growing and getting a larger audience, as opposed to the bigger papers, which are shrinking. But they have yet to have a major political impact because they are so diffuse." Although his newspaper doesn’t “have the bodies to do as much as we used to do, that doesn't mean the work isn't being done” by others in the alternative press, said Denver Post editor Moore. “What I fear with limited resources is that we miss something,” he said. The media drawdown doesn’t make an upset impossible, though. Earlier this year in Virginia, most of the local and national media ignored the primary challenge to House Majority Leader Eric Cantor, only to see him unseated by little-known college professor David Brat. It's the kind of upset that gives a candidate like Republican George Leing hope. “I am realistic and I know it is getting tougher and tougher for traditional newspapers as they don't have the same- size staffs they used to have, and they have to make choices,” Leing told IBTimes, noting that he had received an endorsement from the Ft. Collins Coloradan. Is Gannett Spinoff A Death Knell For Print?